The Wizard of Oz, the 1939 film based on L. Frank Baum's book, was one of the most successful and enduring movies of all time. Its colorful scenes and images are iconic and provide a terrific theme for decorating a nursery, playroom or a party. You won't need complex special effects to recreate the magic of Oz and the yellow brick road. The original set design relied on some very pedestrian materials, including yellow paint from the corner hardware store. 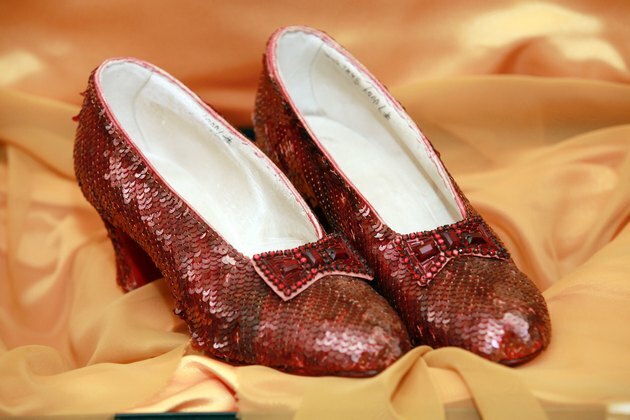 Authentic ruby red glitter shoes worn in the original movie, The Wizard of Oz. Send your Oz fan on a nightly hero's journey in a bedroom with an entire wall painted as a movie scene. With the gleaming Emerald City on the distance, add a poppy field, a witch's stronghold with flying monkeys, and an intrepid trio of adventurers -- the Cowardly Lion, the Tin Man and the Scarecrow -- with Dorothy and Toto leading the way. Paint a snaking yellow brick road in perspective, ending it at the baseboard and continuing it with yellow rug tiles curving over the actual floor. Blue-and-white gingham curtains on the windows and a gingham bedskirt recall the sparkly-shoed fashionista from Kansas. Hang a large framed movie poster on a plain wall. The wizard's hot air balloon makes a colorful mobile to hang over the crib -- flying monkeys are too nightmarish at such a tender age. A nursery filled with Dorothy, Toto and friends is an imagination-rich playground brightened by red, yellow and blue primary colors from the film. Stash stuffed toys of the story's characters in a woven basket on the floor next to a blue rocker with a small rainbow-back cushion. Fill a yellow bookcase with the complete set of L. Frank Baum's original story and 13 sequels, a baby-friendly board book and a nursery lamp with a Wizard of Oz theme. Hang lyrics and a quote from the film in red enamel frames on the walls: "Lions, and Tigers, and Bears! Oh my!" and "Somewhere over the rainbow, skies are blue -- and the dreams that you dare to dream really do come true." A playroom that lasts as kids grow incorporates iconic images, color and form from The Wonderful Wizard of Oz with a few literal nods to the story. Paint one wall in a wash of toned-down green, minus the glitz and glitter, to represent the Emerald City. Add some heart with a large neon heart outline that lights up, or paint the outline of a heart directly on the wall in thin lines of rainbow color. Strings of rainbow-colored paper lanterns overhead are fun and festive. Paint a concrete floor or piece together carpet scraps glued to backing for an area rug with a central spiral of yellow brick road. Hang a "curtain" of red fabric poppies on clear monofilament over windows, inside the frame. A shadow box with a child's outgrown ruby slippers and another with a worn copy of the book flank a flat screen for viewing Dorothy and her merry band. Invite birthday celebrants to follow the yellow brick road to a party for a Wizard of Oz-obsessed kid and use every trick you can think of to create Oz in your playroom or basement. Cover the party table in blue gingham cloth and lay a narrow runner of plain burlap down the length of the table. On the runner, place old shoes -- any kind -- completely coated in red glitter or sequins, bursting with red paper poppy bouquets, interspersed with small figures of characters from the film -- the green-faced witch, Dorothy, Toto and her companions. Hang a curtain of paper rainbow streamers behind both cake table and gift table, and release a multitude of helium-filled rainbow-colored balloons to camouflage the ceiling. Bake a rainbow cake or cupcakes, topped with white buttercream icing swirled with edible glitter food coloring. A hot-air balloon pinata and a pin-the-heart-on-the-Cowardly-Lion game are more movie-themed fun.